I have to publish this post because I do not like misinformation. 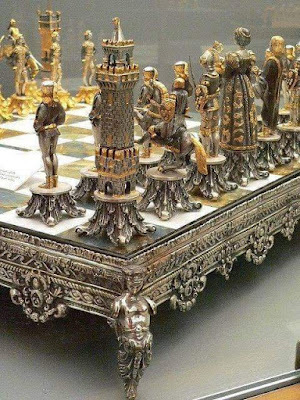 For the three years, a certain photo went viral through Pro-Royal and Pro-Nostalgic Egyptian Facebook pages as the photo of late King Farouk’s magnificent chess set which he received as a gift from his former brother-in-law, late Shah of Iran Reza Pahlavi. 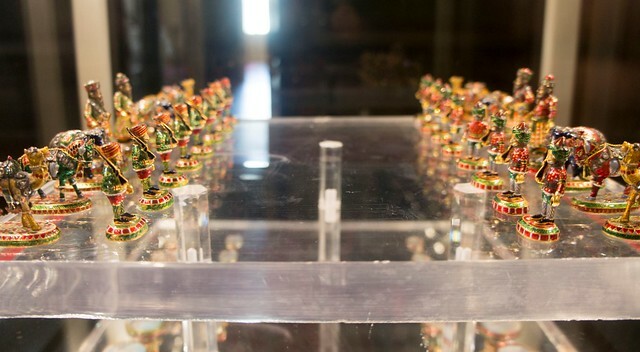 It is a very ugly chess set and thankfully it is not the real chess set. I will share it later in this post. 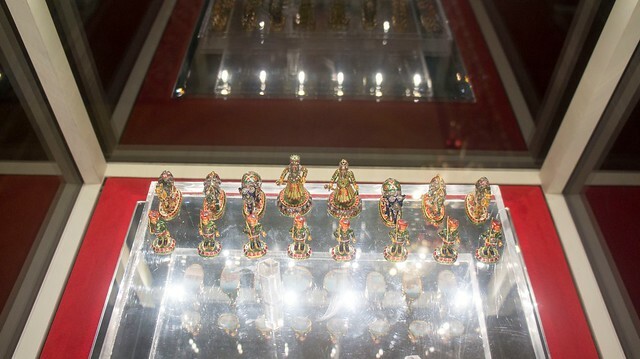 Here is the real and only King Farouk’s chess set as exhibited in Alexandria’s Royal Jewelry Museum. 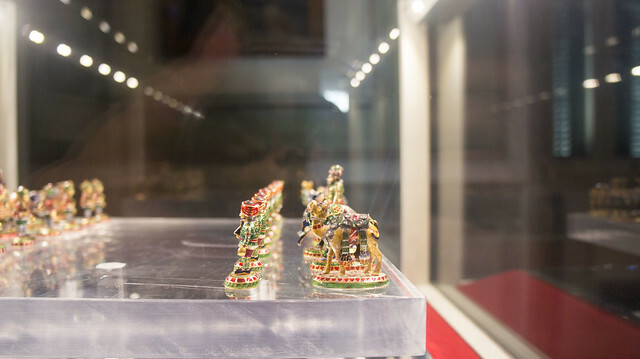 Made gold and encrusted with gemstones, that chess set is another remarkable piece of art from the East. 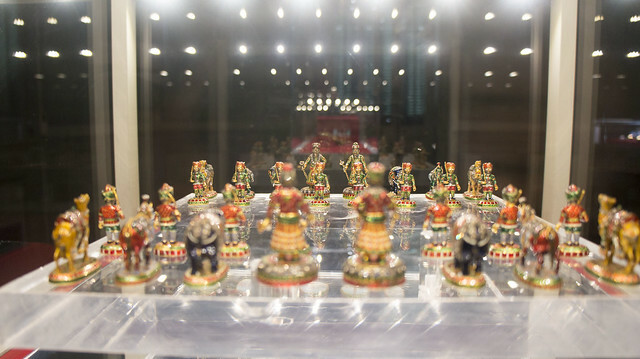 The chess set is model after Indian kings and fighters. 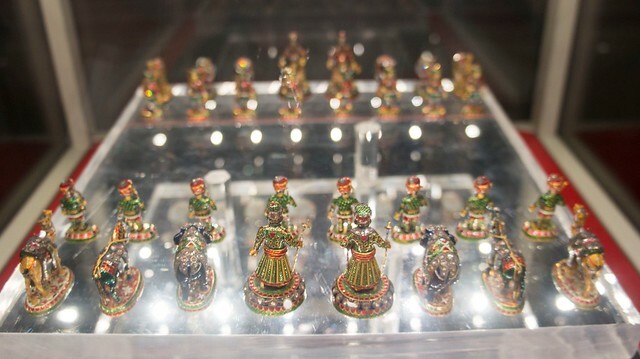 Do you know that chess originated in India? Do you know that its name in Arabic Chaturang, directly comes from its original name in India “Chaturanga”? Now I have got one simple question as I checked back the photos of that magnificent chess set: Where is its matching chessboard? Where is the matching chessboard of that set? I do not think that Reza Pahlavi sent that chess set without its chess board and surely that glass board is not its true chessboard. Even that hideous game of the throne type chess set got matching chessboard !! By the way, I do not think that King Farouk nor Shah Reza Pahlavi even knew how to play chess because if they had done, they would not have lost their thrones like that.